Review: Hada Labo UV Creamy Gel SPF50+ PA++++ | Memorable Days : Beauty Blog - Korean Beauty, European, American Product Reviews. To me, sunscreen is the most important step of my routine and I wish I have been using sunscreen way sooner during my teenage years. I probably wouldn't have so many freckles now if I did so. I have been searching for my holy grail sunscreen for a while which is why I always try out new sunscreens. 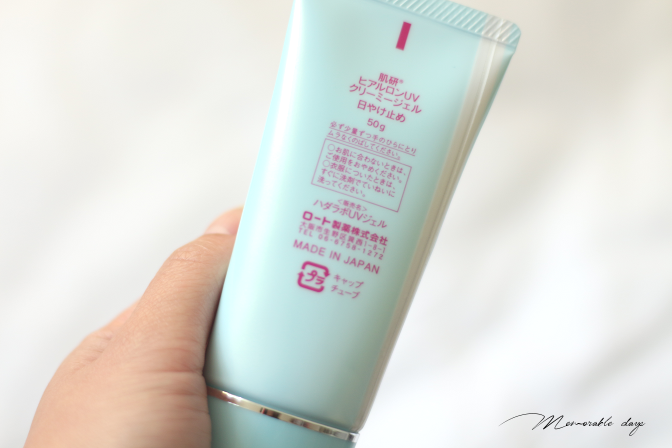 In today's blogpost I am sharing my thoughts about the Hada Labo UV Creamy Gel, which is from a Japanese brand. I purchased this sunscreen a while ago, this is still the old packaging and I saw that in some countries they are selling it in a new packaging. 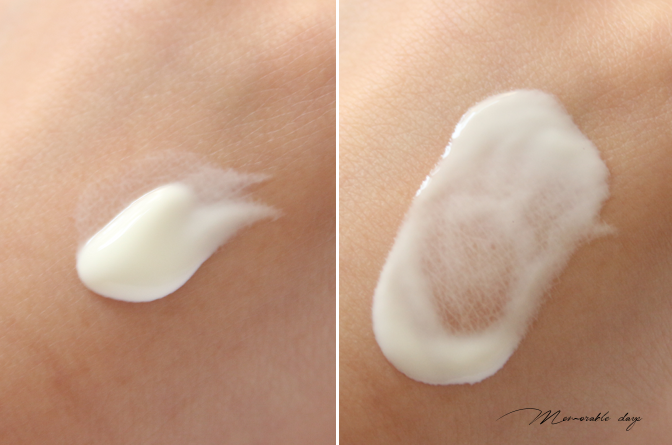 This Japanese UV sunscreen is in a creamy gel texture that makes your skin hydrating. 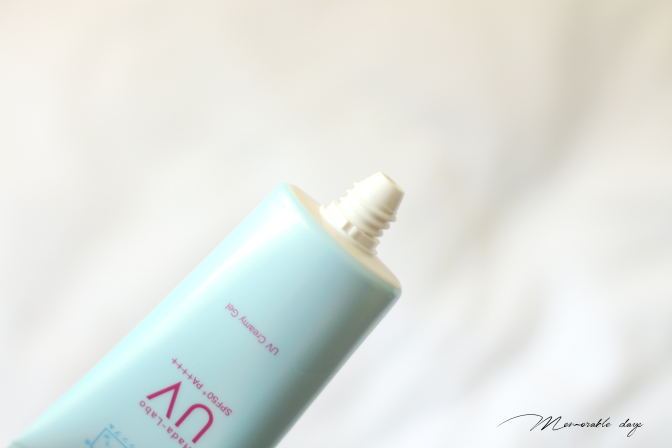 This product contains Hyaluronic Acid which is a hydrating ingredient that helps to moisturize, soften and protect your skin from environmental changes and sun exposure. It has SPF50+ PA++++ and contains 50g of product. It is hypoallergenic, fragrance-free and contains no colorants. It has a blue plastic packaging and you can easily just squeeze the product out. Very simple, nothing special. According to cosdna.com it does contain ingredients that might irritate your skin and yes it does contain alcohol. I normally use it as all other sunscreens, by applying this after my whole skincare routine and using it as a makeup base. A makeup remover or cleansing oil is needed to remove this sunscreen. It has a milky gel texture, not runny. The sunscreen is white and it has a silicone scent to it, it makes me think of glue but it goes away once you have it on the skin. Very easy to spread. Once it's dry, which is within seconds, it doesn't feel heavy or greasy at all. There is no white cast and it just feels moist on the skin. Luckily it's not sticky and it doesn't sit on the skin which many sunscreens do. I bought mine on Ebay a while ago and in some countries they are selling it with the new packaging which is sold here for around USD$16.-. The previous sunscreen that I used was the Kicho Ultra Moisturizing Sun Cream, which I absolutely love but it's on the pricey side so I am trying to find other alternatives. 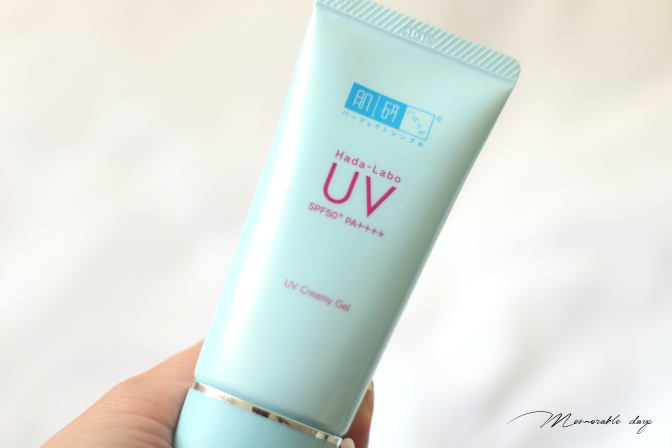 Many bloggers love the Hada Labo UV Creamy Gel which is why I tried it out. I have been using it for a month now and it didn't break me out. It doesn't leave a sticky nor greasy finish and it sinks into the skin within seconds. I like that it has a soft finish while leaving the skin moist. Unfortunately it's a bit too moist for my combination dry skin, which is why this is not THE sunscreen for me. Even when I skip moisturizer, it's still making my skin very oily during the day (more than normal). 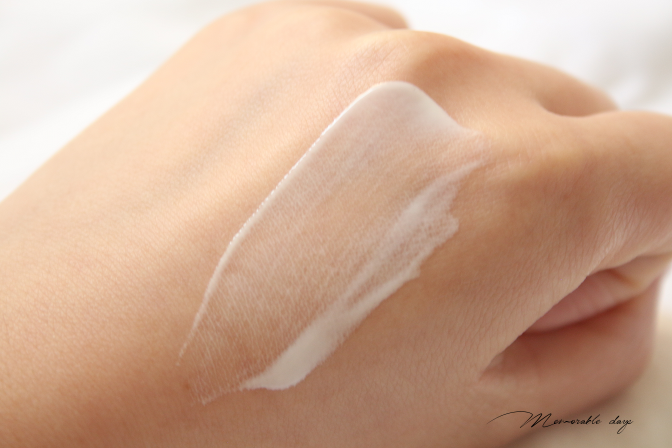 Therefore, it might not be suitable for oily skin types neither but more for the dehydrated/dry skin types. note: this product was purchased by me, see disclaimer.